How He Saved the town of Filiatra in Greece: The miracle took place in the small Peloponnesian town of Filiatra in 1943, during the dark days of the occupation of Greece by the Germans. This miracle has moved and continues to move, to this today, not only the people of Filiatra but also the people of all Greece. In Tripol, the Priest, Archimandrite Theodore Kotsakis, who was originally from Filiatra, learned of this plan. Grief and worry overcame everyone; no one knew what to do to save Filiatra and its people. So, the priest Theodore found someone who knew German, and together they went to the house of the German Officer in Tripoli. But while they waited outside his office, loud voices, cursing and a great upheaval were heard. A Greek woman pulled on the priest’s cassock, urging him to leave, so that they might not be killed there, right on the spot! From his fright he woke up. He tried to speak but couldn’t, rather his mouth was agape as he looked at the image in his dream, the old man that he saw three times in his dream who had the appearance of a Saint of the Orthodox church. When he came to his senses, he began thinking of the evil that was about to happen: the slaughter of human beings, like dogs to remain on the streets without burial and of houses burning in seconds which had taken centuries to be built! At daybreak, the decision by the Germans to revoke the order was announced. Everywhere there were shouts of joy to be heard by the townspeople, in the cafes, in the square, in the streets…. One battalion, then, of German soldiers with Officer Kondau and two Orthodox priests in the middle, walked down the street going from Church to Church. They started at Saint John’s, then Saint Nicholas’, then Saint Athanasios’ and finally headed for the Church of the Panagia (The All holy one). There are no words to describe the joy felt by the people of Filiatra and their gratitude toward the Saint. They glorified God and they thanked Saint Charalambos for the miracle. And just as the Saint had told Officer Kondau, the leader of the garrison, and all his men, after the war was over, they returned safely to Germany and to their homes, without anyone being harmed. The German Officer, thus, preserved vividly the memory of this miracle and showed gratitude to the Saint. He hoped to return from Germany to venerate him. And in fact, after two years, he came with his wife to the town of Filiatra. But, on his first pilgrimage, he didn’t quite make it for the Feast Day of the Saint. He came one day later, on February 11th. When, however, the people of Filiatra saw him, they were so overjoyed that they celebrated the Feast Day all over again. They chanted the doxology; they held receptions and dinners and other festivities. And up until recent times this German Officer with wife and family and other countrymen have come on the 10th of February to the town of Filiatra to venerate and pay homage with faith to this Saint. In their hearts Orthodoxy had blossomed. 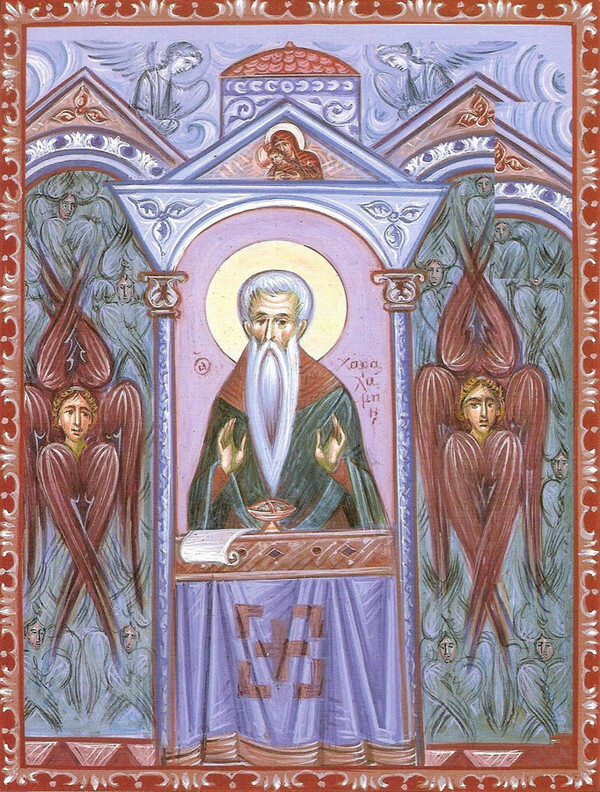 Holy Saint Charalambos Pray to God for Us! Translation by Narthex Press ~~~ Translated from the Greek by V.A.C. 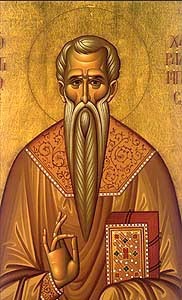 This Saint was a priest of the Christians in Magnesia, the foremost city of Thessaly, in the diocese having the same name. He contested during the reign of Alexander Severus (222 A.D. - 235 A.D.), when Lucian was Proconsul of Magnesia. At the time of his martyrdom the Saint was 103 years of age. The invincibility of Christianity is epitomized by the superhuman endurance of the priest Charalambos, who suffered inhuman tortures and martyrdom at the hands of pagan tormentors. No single martyr was recorded to have endured as much physical punishment as Charalambos. He was an obscure Orthodox priest who earned his sainthood solely by his steadfastness to the Christian faith in the face of prolonged agonies. A man of the people, Charalambos brought the light of the Lord's love to everyone in his community. In so doing he also brought down upon himself the envy and wrath of those in power. The provincial governor, Lukianos, had little regard for the welfare of his people; for the Christians he had nothing but utter contempt. A confrontation between the governor and Charalambos was inevitable, as was the result of their meeting. After a brief exchange of formalities the governor unequivocally declared that Charalambos must renounce Christ or be punished. This set the scene for the longest period of human suffering in the name of the Savior. When he refused to worship the idols, his persecutors began a planned assault on his body. Lukianos unleashed his merciless hatred for Christians. Charalambos was first lashed to a post in the public square to be held up to a public scorn and ridicule. Then they slashed him repeatedly with sharp knives, taking care that no wound would be fatal. When Charalambos refused to denounce the Lord, they cut him down and dragged him through the streets by his beard. He endured the extremely painful grating of his skin by the pebbled surface as well as the merciless kicking of sandaled feet. Finally propping him up on his feet, they demanded that he renounce Jesus; once again he refused. When their methods of punishment only served to draw converts to Christianity, Charalambos' enemies sought to put him quickly to death. The local people, however, rose in opposition to his planned death. Charalambos had helped many afflicted people who were brought to him. The matter was brought up before Emperor Severus, who ordered the 103 year old battered priest to be brought to Antioch, Syria. Once there, Charalambos was led through the streets with a horse's bit in his mouth. Then they nailed him to a cross. Not only did Charalambos refuse to relent, but he also refused to die. Then they ordered him to be beheaded. Just as his executioners were about to carry out the sentence, a voice said, "Well done, my faithful servant; enter into the Kingdom of Heaven." At that moment he died without a blow being struck, thus denying the pagans their revenge. The two executioners were immediately converted. Source: The Great Horologion (Book of Hours), translated from the Greek by the Holy Transfiguration Monastery. Also, Orthodox Saints, Spiritual Profiles for Modern Man January 1 to March 31, by George Poulos. Αναρτήθηκε από ΝΕΚΡΟΣ ΓΙΑ ΤΟΝ ΚΟΣΜΟ στις 1:23 μ.μ.